Mashable has named SnowShoe one of the Top 10 Under-the-Radar Tech Startups to Watch. The list was put together by the Young Entrepreneur Council (YEC), and includes startups “solving real problems and changing the way we interact with our daily technology, from hardware that authenticates smartphone transactions to digital billboards to Near Field Communication (NFC) technology.” SnowShoe is a growing firm that develops innovative technology solutions for mobile platforms including the SnowShoe Stamp â€” a piece of hardware used to authenticate smartphone transactions. Check out the full article on Mashable here. 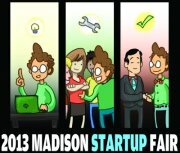 The 2013 Madison Startup Fair features successful startups from the Madison area. Anyone interested in technology and entrepreneurship can talk one-on-one in an informal environment with startup founders and employees about their experiences. Find out more about the burgeoning Madison startup scene and the opportunities startups have to offer, including ways you can get involved by starting your own company or through internships and full-time positions with existing startups. The Startup Fair is co-organized by Capital Entrepreneurs, Hybrid Zone X (HzX), The Hub, and the UW-Madison chapter of CEO. For more info, check out the Madison Startup Fair event on Facebook. Many Capital Entrepreneurs startups will be attending including: PerBlue, Hardin Design and Development, Murfie, Snowshoe, Vidmaker, Asthmapolis, gener8tor, Ronin Studios and Consulting, WomStreet, Trinker, WeMontage, MobileIgniter, Quietyme, SpanDeX, AppSolute Innovations, Sector67, EatStreet, Bendyworks, and more. The Doyenne Group is organizing a 2 day Design-A-Thon event to take place on February 9-10 at HotelRED in Madison. The Design-a-thon is an event where women can explore and have fun with the entrepreneurial process. Women will register in advance, propose ideas, work in teams to explore/build the idea for 24 hours, and then pitch the idea to a panel of judges for feedback. Meals, snacks, and beverages will be provided during the event and Discounted HotelRED room rates are available. The Doyenne Group is part of the Capital Entrepreneurs network and is a networking/mentoring group for women entrepreneurs. They provide support for women as they develop themselves as entrepreneurs, found and build their ventures, and help women become more fully engaged in the broader entrepreneurial community. For the Madison digital startup scene, 2012 was a year of growth and validation. The number and impact of startups within the Capital Entrepreneurs community continued to grow, and many of those startups saw a lot of success. In 2012, Capital Entrepreneurs companies created over 125 full time jobs, raised $10.6 million in funding, and produced multi-million dollar revenue streams. The energy and excitement that has been building within the scene around all the awesome things that are happening has begun to be recognized by others locally, and even around the nation. These contributions played a key role in Madison being recognized as a top place to live and work as a young entrepreneur, the best city in the country for young adults, and being hailed as one of the leading tech hubs in the nation. Capital Entrepreneurs members have worked closely with city leaders and played a key role in launching Madisonâ€™s Open Data Initiative, making Madison the 2nd city in the country to adopt such a progressive open data policy. This helped solidify Madisonâ€™s role as a forward-thinking and tech-savvy city. The Forward Technology Festival was back for itâ€™s 3rd year. It was held over 11 days and encompassed 16 different events with over 2000 people taking part. The festival was headlined by the Forward Technology Conference, and with its record attendance brought leaders from the Madison tech community and beyond together for a day of sessions, panels, and networking. BarCamp, the Madison Ruby Conference, and a Social Entrepreneurship Symposium also highlighted the festival, and Capital Entrepreneurs hosted an Open Social as well as a Pitch Panel. The first ever Capital Entrepreneurs Week was highlighted by Startup Weekend and 3 Day Startup, as well as other entrepreneurship focused events including a talk from Jason Fried. The biggest and best yet Build Madison was back at Sector67 for the third 24 hour community create-a-thon since 2011. There was also a CityCamp event focused on civic hacking and a 3D Printing Camp. Capital Entrepreneurs companies participated in accelerators around the world. Murfie graduated from TechStars Boston and Vidmaker graduated from TechStars Cloud in San Antonio. The new Madison and Milwaukee based seed accelerator gener8tor graduated its first class of 7 startups. Portable Scores graduated from Haxlr8or – the first accelerator geared to hardware startups. Sector67 continued to play an increasingly important role in the community and has enabled a number of companies to prototype and launch entirely new products – including the SnowShoe Stamp and cast iron skillets shaped like states. They have even been launching things into (near) space. Horizon Coworking, which began as a pilot co-working space just over a year ago, has more than doubled in size. The Capital Entrepreneurs network of organizations has begun to expand with the addition of The Doyenne Group which focuses on helping women entrepreneurs, and Madison Iterators which is a weekly peer accountability meetup. Capital Entrepreneurs members were named to the InBusiness 40 Under 40, the UW Alumni Associationâ€™s Forward Under 40, and recognized by Under30CEO. Fishidy and Style Shuffler were finalists in the Governorâ€™s Business Plan Contest. PerBlue and Murfie were named as Madisonâ€™s Favorite Tech Startups by the Isthmus. Capital Entrepreneurs companies were featured in press outlets around the world including Forbes, Wired, Fast Company, The Wall Street Journal, The Economist, Adweek, CNET, CBS and were also featured in every major local publication. Theyâ€™ve even held the top spot on Hacker News. Networked Insights was named one of the 50 Most Innovative Companies in the World by Fast Company. PerBlue was named to the Empact100 list, which recognizes the top startups in the country run by young entrepreneurs and Murfie was selected for the START150, which recognizes the worlds most exciting and disruptive startups. Entrustet was acquired, and Asthmapolis was named the most promising HealthTech company. SnowShoe even took the top spot at the TechCrunch Disrupt Hackathon. There are many truly exciting things happening in the Madison startup community, and 2013 is looking to be another great year with many more exciting things to come. Cheers! The past year has been a whirlwind of new games and some amazing local and national recognition for PerBlue. We were so proud to have been recognized by several organizations within the last year. PerBlue was a finalist in the GetDiscovered! Contest, recognizing awesome Android apps. Pocket Gamer named us one of the top 10 â€˜Developers to Watch in 2012â€™. In May, we were featured on Forbes in â€œHow I Launched My Mobile App From My Apartment”. Then in October, Justin was invited to the White House for the Empact100, honoring the top 100 startups in the United States. We were really involved in several of Madisonâ€™s technology and hackathon events. Groups from our team attended and participated in hackathons, BuildMadison and Startup Weekend this year. The Isthmus named us the â€˜Best Tech Startupâ€™ in Madison for their annual Best in Madison feature. Justin Beck was featured in this fun video about innovation at the UW. We launched a few new games in 2012. In the style of our flagship title, Parallel Kingdom, we released two additional location-based MMORPGs, Parallel Mafia (March) and Parallel Zombies (July). Another topic of interest for us this year was casual games. We launched two casual games over the summer, Bugduster and Bob vs. Bear, available free on Google Play. Our first location-based title, Parallel Kingdom remains our primary focus. We recently announced a new Age. Each Age introduces a large set of new features, mechanics, and artwork. Itâ€™s been over a year since our last Age and our players are really excited about the upcoming release. Parallel Kingdom reached many notable milestones this year. In January, we surpassed 1 million registered user accounts. As part of our continued partnership with PlayMob, our players donated over $4,000 to HelpUSA, Kitty Kind, and 4 Paws for Ability. When our players weren’t donating to various charities, they were really busy building Parallel Kingdom. Check out this awesome infographic of interesting statistics from the game. Our CEO, Justin Beck spoke at three of the four Game Developers Conferences (GDC) this year. His presentation â€˜Bootstrapping 101â€™ was highly rated at each GDC conference, and Justin was selected as one of this yearâ€™s top 50 speakers at the conference. He also participated in the first annual Mobile Gaming USA conference, the Forward Technology Festival, and made several trips the the UW to give entrepreneurial advice to engineering and business students. PerBlue Headquarters was a busy place this year. Over the summer we had seven interns in the office. From our development team, to the marketing team, these interns helped our full-time staff on various projects. The summer months were also full of company cookouts, ultimate frisbee games, and a beach volleyball social. As the winter begins, we’ve just completed our second annual â€˜Holiday Board Games Driveâ€™ and collected over 20 games for Domestic Abuse Intervention Services (DAIS). Oh yeah, and we just launched another game last month. Boardtastic, the only 3D skateboarding game on Google Play. The game drops players at the beginning of an exciting pro-skateboarding careers. Boardtastic has over 30 tricks to master in three skateboarding parks all over the world. The game is available for free exclusively on Android devices. We are already predicting 2013 to be another great year at PerBlue. Stay up to date with all of our projects by following us on our blog, Facebook, and Twitter pages. Check out past PerBlue news posts here. Last year Murfie was a roller coaster. This year weâ€™re an airplane. An airplane during takeoff. Weâ€™ve got our engines roaring, our flaps and slats are deployed and weâ€™re entering the climb phase. We expect a few bumps here and there during ascent (weâ€™re a startup, afterall), but weâ€™re happy to be finally off the ground. Maybe next year weâ€™ll reach cruising altitude? Check out past Murfie news posts here. The forward-thinking initiative that began nearly 1 year ago took a huge step forward with the launch of the City of Madison open data portal today. Madison became the 2nd city in the nation to adopt an open data ordinance last year, and today released more than a dozen data sets. The goal is to make data collected by the city that is public, but difficult to obtain, available to the public and developers via open standard APIs. This allows the tech community to leverage the data to build value-add apps and services which benefits the greater public. The technique – called “civic hacking” – has gained much traction and provides an outlet for developers to build something that benefits the community. Capital Entrepreneurs founding member (and Alder) Scott Resnick worked closely with the Mayor and the City IT department to bring this to fruition. For more information, check out the Wisconsin State Journal article here. Networked Insights continued to experience inordinate growth in its client base, revenue, operational scope, and team size during 2012. Revenue from clients increased by over 300% from 2011. The company greatly expanded its list of household client names by adding companies such as Samsung, Duracell, Almay, General Electric, Dell, and Allstate Insurance to its client roster. Additionally, NI continued to expand its relationship and work scope with such major advertisers as MillerCoors, MTV, Research in Motion. The company also received significant media exposure again in 2012 being highlighted in publications such as the Wall Street Journal, Adweek, Advertising Age and others. Most notably, the company was highlighted by Fast Company Magazine as one of the 50 Most Innovative Companies in the World, alongside Facebook, Google, and other household names. Beyond simply adding well-known companies to its client roles, Networked Insights has steadily increased the magnitude and scope of its services within the marketing departments of these companies. Once funded by small budget experimental marketing and research teams, the company now delivers insights that sit at the heart of major strategic decisions for many of these clients. Several examples of these were recently highlighted in a Wall Street Journal from October. The most significant product development for the company in 2012 was the re-establishment of its flagship product SocialSense as a standalone, client facing technology. In recent years the company had focused on delivering its social media analytics by way of a growing services organization while it worked behind the scenes to improve the tools and underlying technology that did the heavy lifting for that research. At the request of several clients, the company developed a completely new user interface and launched SocialSense 4.0 to great client fanfare in second quarter. To support the increasing sales success, Networked Insights greatly expanded its staff over the course of the year, particularly in its Chicago office. The company now has over 100 full-time employees working in company offices in Madison, Chicago, New York, Toronto, Los Angeles, and a few other remote locations. Looking ahead, the company plans to continue to evolve the scope of its SocialSense product by expanding to include more sources and types of data. The goal is to create a true enterprise marketing decision platform that provides groundbreaking insights and marketing activation capabilities to greatly improve the efficiency and effectiveness of marketing and advertising budgets. Check out past Networked Insights news posts here. In 2012 my best friend Ben Sperry and I, two recent UW-Madison graduates, started a startup called Codiqa with a dream to make it easy for anyone to build mobile and web apps with HTML5 technologies. We entered private beta right after new yearâ€™s (bad idea, I guess normal people take vacations), and then we launched publicly at the end of February. We grew our first beta user base almost exclusively through twitter and a landing page that encouraged sharing across social networks. We had our first big break at the end of February when we were featured directly on jquerymobile.com, where we still contribute to jQuery Mobile development to this day. We blogged how that got us over 10k users in a month, despite us getting rejected from YC a few months earlier. That post shot to the top of Hacker News for an entire day and brought us a lot of outside attention. In March we started charging for Codiqa, and at the beginning of April we charged our first credit card ever. Since then, weâ€™ve expanded our user base to almost 100k users spread out in over 35 countries around the world, and slowly became profitable enough to pay two founders full time. And that’s all without raising a dime of outside funding or dipping into savings or debt. In 2012 we closed several licensing deals with large international companies, and we’ve cultivated relationships for many more to come. We also launched our second product, Jetstrap which has seen large adoption in the Twitter Bootstrap developer community, with over 40k users signing up since October when it was launched into beta. We are so excited to be a growing part of the Madison startup community. In the three years since I entered the community, 2012 seemed its best year, with more startups being created that have seen real traction and acclaim outside of the area. Its best days are to come! Check out past Codiqa news posts here. 2012 was a great year for Optimal Media Group and the NightOut sites. We removed underperforming products and reinforced and strengthened our core products while adding an incredibly lucrative loyalty program. We continue to modify and upgrade the functionality of our user interface for an improved visitor experience. The best improvement this year has been the addition of an onsite designer and two new sales people. Our designer has enabled us to create new marketing material and offer design support to our licensees. With this addition comes the ability to spend more time with our new licensees training them in the site functionality helping them develop their business. We now can help them develop the content on their sites and help with marketing campaigns and sales presentations. This has been very well received and appreciated by our new licensees. In July, we added Prestige Rewards loyalty program. The program is free to all consumers and allows them to earn cash back directly to their registered credit cards from participating merchants. There are no additional cards to carry or hoops to jump through. Simply register your existing debit or credit card on our secure site and pay as you normally pay. Each time you use your card at a participating merchant, you earn cash back. We will soon be releasing Optimal Mobile Technology, which will allow our licensees to offer phone apps to their clients. They will be able to sell the app, create the app, and update it as necessary. The client will be able to present push notifications at the most opportune times, post menus and specials, or announce any exciting news or event in their business. This is one of the best ways a business can communicate with their loyal customers. With additions of team members and with new products, 2013 will be our best, most exciting year since our inception. Check out past Optimal Media Group news posts here. Portable Scores is a Madison startup building a connected portable electronic scoreboard for recreational sports. Founded by Bob Baddeley in February after a long period as a part-time hobby, Portable Scores immediately traveled to China to participate in a new hardware startup called HAXLR8R. After 3 months learning about manufacturing, sourcing, and hardware distribution and sales channels, the company returned to the United States to recover. In July the company doubled in size and acquired a co-founder (Perry Sieber) to focus on the business while Bob developed the product. They have been refining their design for manufacture, building prototypes and getting them in the hands of users, and exploring fundraising and sales channels. With customer discovery complete, a manufacturable design and factories ready for production, and positive feedback from beta testers piling up, 2013 promises to be a big year for Portable Scores. Check out past Portable Scores news posts here. WomStreet wraps up an amazing first year with a bang, launching one of their most viral contests to date. The contest was a promotion for 6 pop icon DJs. In just 1 hour after launch, the contest set a submissions record with nearly 40 entries. It was their 42nd contest, with over 30 different customers, and they now have over 11,500 active users. WomStreet is starting a new year with an angel round of financing (anticipated to close by mid-January), and is currently looking to hire a VP of sales. Check out past WomStreet news posts here. To bring us into 2013, we’ll be looking back at 2012. There were a ton of amazing things that happened in 2012 within the Capital Entrepreneurs community and the Madison Startup Scene and we’d like to share them. We’ll be kicking off a series of posts from Capital Entrepreneurs companies summarizing their year in review, and we’ll cap it off with a full 2012 Madison Startup Scene Recap post. Stay tuned!